Pin It This week's "How Much Does It Cost" is from STEMS Floral Design. Candelabra retails at $400.00 each. 10 white antique hydrangeas at $12.00 each. 3 large white calla lilies at $9.00 each. 6 yellow tulips at $3.00 each. 9 yellow garden roses at $7.00 each. 3 short votives at $3.00 each. 1 stem of white phalaenopsis orchids at $35 each. Total cost of this centerpiece is $447.70. We have already explained in detail what goes into meeting with clients, creating the proposal, making the inspiration board, sourcing out the flowers, and finally prepping the flowers the week of the event. 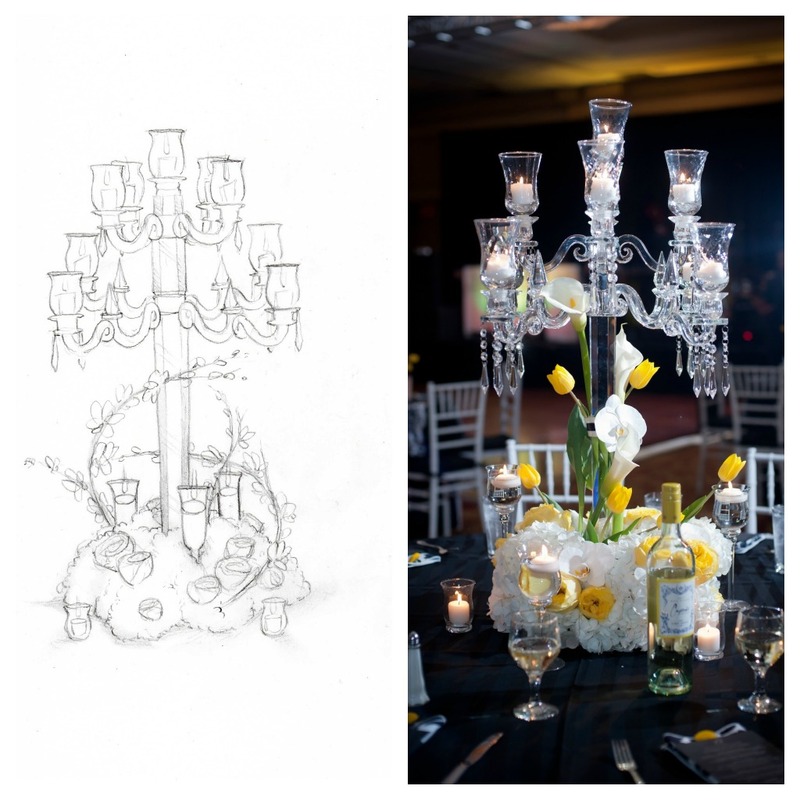 Just as in creating a bridal bouquet, all those same processes apply for designing a centerpiece. When the time comes to make the centerpiece, the flowers around the base are put together the day before in a shallow plastic plate with oasis foam, which holds water and allows the flowers to stay fresh. The flowers are carefully placed to hide the mechanics underneath so none of the foam or plastic plates show. The floral base is transported with the candelabras, which are carefully packaged in large boxes with lots of cushion and packing material, in air-conditioned delivery vans. Each candelabra box and floral base takes up over 4 square feet of space, which adds up quickly when you are packing up vans for a delivery. They are also heavy! Weaving in and out of hotel elevators and narrow staff corridors with multiple boxes and multiple trips on carts makes for a very long day. The candelabras are put together on site, each box containing carefully wrapped parts, in a total of 22 pieces. Each arm gets four dangling crystals, which also have to be added for a grand total of 54 parts. Once put together, it takes two people to gently lift the centerpiece into the middle of the table. Votives are placed around the edges and dropped inside the cups. The tall votives are packaged in boxes and also have to be unwrapped and placed—water from the kitchen plus floating candles to complete the table. An average delivery and set up for an entire event... from the time we begin loading the van till we clean up the studio and are finished for the day... typically takes about 5 hours and usually takes between 3-8 people. Cleaning up is the same thing except backwards. Most clean ups are very late at night after the event is over—sometimes the next day, but most of the time very late at night. The tall votives are emptied of their water into buckets and repackaged in their boxes. The burned votives go back into crates. All 54 pieces of the candelabras are carefully wrapped back up and put away in their boxes. Everything is loaded back into the vans and brought back to the studio. An average clean up takes about an hour and usually takes between 3-8 people. The last phase of the process is not glamorous, but important and ultimately meaningful. CLEANING. Everything is cleaned, repackaged, polished and restocked. The votives are painstakingly dug out, then run through the dishwasher. The candelabras are wiped down and polished to keep the crystal clean. The water tubes that held the orchids need to have the water emptied and be put away. The plastic liners are also wiped clean, and old oasis is discarded. The flowers themselves are often repackaged into vases and delivered to nursing homes, hospitals, and non-profits—as was the case for the centerpiece showcased here. The clean up is very tedious and on average takes quite a few people at least a full day to clean up from a weekends worth of event's. And we're exhausted just thinking about it... : ) But the end result is priceless when you see the happy client, and hear guests literally oohing and ahhing over what was created.